Nothing says “Happy Thanksgiving” like a chestburster at the dinner table. 20th Century Fox dropped a little pre-Thanksgiving surprise tonight by unveiling the very first poster for Alien: Covenant, director Ridley Scott’s follow-up to Prometheus. It’s an unnerving one-sheet that relies on the iconography of H.R. Giger’s Alien design, signaling to fans that this Prometheus sequel will very much tie into the Alien franchise as a whole. But the poster also carries more information than meets the eye. The one-sheet boasts a “May 2017” release date tease as 20th Century Fox has also decided to move up the release of Alien: Covenant from August 4, 2017 to May 19, 2017. It’s the rare blockbuster shift that actually sees the movie arriving earlier rather than later, as many studios push back their pricey films in order to ensure the film is, you know, actually done. But it appears that Scott has been working quickly in post-production on the pic and it’ll be ready to enter the gauntlet of the Summer 2017 Blockbuster Season. Covenant will now open directly opposite the horror sequel Annabelle 2, the kid-centric comedy Diary of a Wimpy Kid: The Long Haul, the animated feature The Nut Job 2, and its biggest competition: the Dwayne Johnson/Zac Efron-fronted action comedy Baywatch. This puts the film opening a week ahead of Pirates of the Caribbean: Dead Men Tell No Tales and two weeks before Wonder Woman, but it also offers audiences a chance to catch a big-budget R-rated blockbuster for a change of pace. The release date shift also leaves August 2017 pretty barren, but one imagines it won’t stay that way for long. The film that benefits most is Edgar Wright’s unique actioner Baby Driver, which is slated for release on August 11th. It’ll be interesting to see if any of the July blockbusters take advantage of Alien: Covenant’s move and shift to the early August date, which has seen success for films like Guardians of the Galaxy and Suicide Squad. I could easily see Luc Besson’s sci-fi pic Valerian and the City of a Thousand Planets or Sony’s highly anticipated The Dark Tower moving out of the July corridor and into early August. While Scott originally intended for Prometheus to kick off a new prequel franchise that would exist tangentially to Alien, he subsequently decided the follow-up would instead move closer to the original Alien franchise. 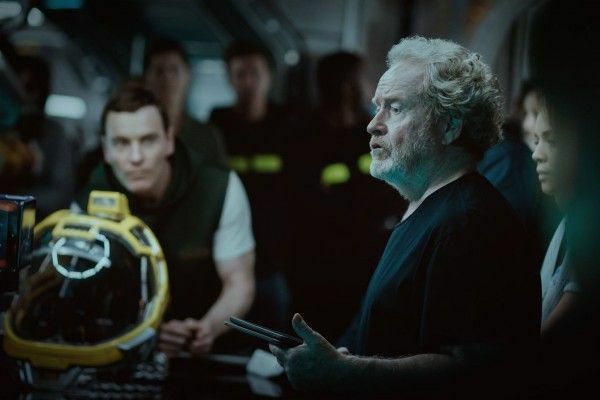 Michael Fassbender is the only returning cast member from Prometheus to have a substantial role in Alien: Covenant, as he encounters a new crew of explorers that includes Katherine Waterston, Danny McBride, Demián Bichir, Billy Crudup, Amy Seimetz, Jussie Smollett, Carmen Ejogo, and Callie Hernandez.